A full country breakfast, served in the restaurant, is included in the cottage rental rate. What are our options for dinner? 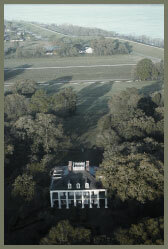 While the Oak Alley Restaurant is open for breakfast (8:30 a.m. – 10:30 a.m.) and lunch (11:00 a.m. – 3:00 p.m.), it is not open for dinner. However, we can arrange for in-room evening dining if guests would care to pre-order an evening meal (must be pre-arranged by 2:00 p.m. the day before arrival). Chef will prepare your evening meal in advance, and have it stored in your cottage for later enjoyment. The staff is also happy to help you make reservations at an area restaurant, if you prefer. Call 1-800-44-ALLEY and ask for reservations to make your arrangements. All cottages are non-smoking. Smoking is allowed outside only. Cottage 3, 4 & 6 have televisions. Cottage 5A, 5B do not have TVs. Free wireless internet is provided in all cottages. What about touring the mansion and historic grounds? Due to the high volume of repeat cottage guests, Big House tour tickets are not included in your stay. Who can we speak to once we arrive? An attendant is located in the Restaurant Office to check you in, take reservations, answer questions, make suggestions, etc. until 4:30 p.m. The Restaurant Office is the white building located across the walkway from our Restaurant and Gift shop. After 4:30 p.m. check in at the Ticket Booth seven days a week until 9:00 p.m.
How much do you charge for additional guests? Do you have a handicap accessible cottage? Yes, Cottage 7 is our only handicap accessible cottage. Cancellations are only honored via telephone (800 44-ALLEY). Cancellations are not honored if sent via email. We have a 14 day cancellation policy. If you cancel your reservation 14 days or more prior to your arrival date, there is a $30 charge, per night, for cancellations. If reservations are cancelled within the 14 day period before your arrival date, the full amount will be charged to your credit card. If we are able to re-rent the room, your card will be refunded for that amount, minus the $30 cancellation fee. Overnight cottages are open year round. On major holidays (New Year's Day, Mardi Gras Tuesday, Thanksgiving Day and Christmas Day) the "Big House" and Restaurant are closed and a 2 day minimum stay is required. A continental breakfast will be placed in your cottages on these days. Other meals may be arranged ahead of time, please inquire upon making reservations on major holidays.